← Wales at Waters’ Edge nominated for Welsh Book of the Year Award…but only under the author’s name. Much has been said in the film versus digital debate. I was a film user for many years and perhaps withstood the digital explosion for a little longer than I should have done. But there is one situation in which digital wins hand over fist. 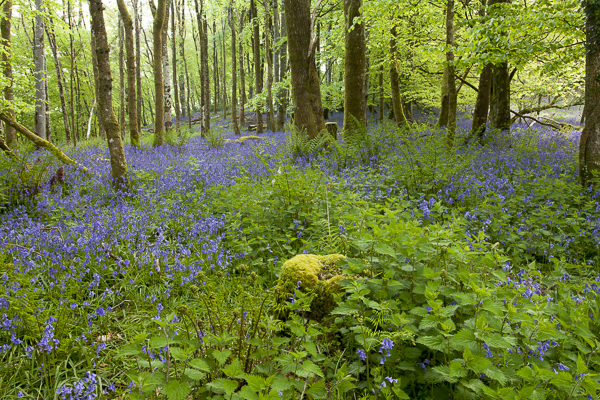 Last week I visited Castle Woods, near Llandeilo in Carmarthenshire, to photograph the bluebells there. What a display! The best in Wales, someone told me, although I cannot vouch for that….. Conditions were perfect. There was little wind to cause unwanted movement of the flower spikes or beech leaves. Light cloud cover acted as a giant diffuser, preventing the appearance of disruptive shadows and areas of excessive contrast on the woodland floor. Oh joy! The great advantage of digital is that the bluebells are actually recorded as blue on the sensor, rather than the ghastly purple or puce they would appear as on film. Much was written in the photographic press about how to get blue bluebells in those days. Perhaps that was why they invented digital? My visit to Castle Woods took place on the journey back from Skokholm Island, off the Pembrokeshire coast, where I spent three days. I may write more about that at a later date but needless to say I spent many happy hours in this wonderful place filling memory cards with images of birds, many of which I will eventually delete. Oh, hang on………. there’s another big advantage of digital. However did wildlife photographers manage when each single click of the shutter was measured in actual money spent on film? This entry was posted in Uncategorized and tagged blue bluebells, bluebell photography, film versus digital, photographing bluebells. Bookmark the permalink.